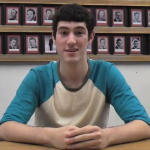 Last year, when it was time to pick senior project topics, PAM student Devon Yaffe was unsure of what he wanted to do. He knew he wanted to pick something that appealed to him, and he wanted to put a twist on something. “That’s when I decided to call [The Gay and Lesbian Housing] and have them tell their stories. One generation at a time,” said Yaffe. After talking to workers from the gay and lesbian housing, Devon was able to interview two men who lived there. The interviews consisted of 13 questions and were asked to men between the ages of 82 and 15. Devon decided he wanted to make a documentary, titled Overcoming Adversities As a Gay Teen One Generation At a Time, that went into detail about how some men overcame their adversities of being gay. Ten men were asked all the same questions, starting with the oldest and ending with the youngest. Throughout the documentary, these men tell their stories and what they went through being gay. In the documentary, many of the men revealed that they thought they would be rejected by society, but many of them were accepted by friends and family. In time, many people have learned to accept gay people and have even become very open minded to the topic. Yaffe posted his documentary on Youtube and posted his video on fan pages on Facebook. His Youtube video now has more than 5828 hits. Yaffe received many responses from his documentary. “One fan page told me my documentary was amazing to see…It’s an eye opener. It’s something people need to see,” said Yaffe. Students from Hollywood High School were amazed with his creation. Yaffe wanted more people to hear these stories and to get a message across to them that in the end, everything will get better. Now that Yaffe’s enthusiasm has grown so much, he wants to go forth and show his documentary to middle schools. “I want to tell them how they can also overcome. I want to hold assemblies and bring awareness. This will be a dream come true,” he said.